AO-40 was more than a decade in coming. Its long period of gestation gave us time to ponder the possibilities for upgrading to higher and higher bands. It always appeared to this author the "big gun" on AO-40 was going to be the X-band (10 GHz) downlink—a 50 Watt TWT feeding a high gain dish antenna. The catastrophe silencing the easy-to-hear 2 meter signal also, unfortunately, muted the X-band downlink. 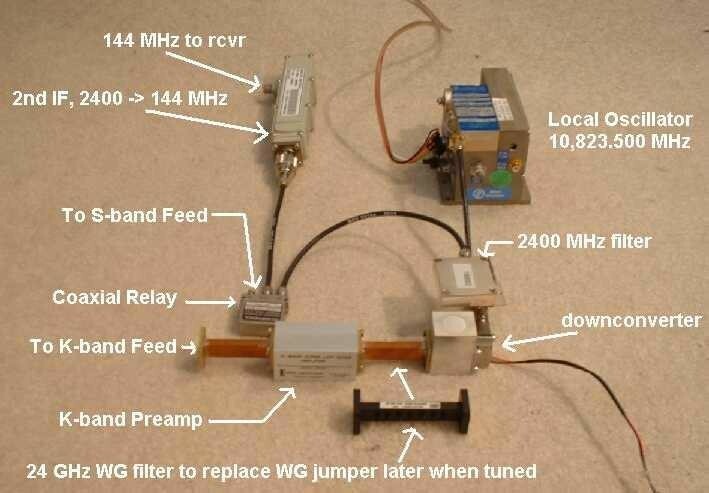 We were left with no "transition" microwave band to bridge us from the relatively plug-and-play world of S-band (2.4 GHz) operation to the realm of "real" microwaves. All, we were told, was not lost. We still had K-band (24 GHz) as a downlink. 24 GHz? 1.3 cm! Surely they were joking: before AO-40 I did not know we had a 24 GHz satellite band! K-band was the world of near-mm waves, of waveguides and horribly expensive components, and… of the unknown. So, with a mix of curiosity and apprehension, I went to the 2001 AMSAT-NA Symposium's "K-band breakfast" hosted by KC2HAX (1). All my fears were confirmed: this was a multi-kilo-buck dream. The challenges were formidable, including daunting weather implications and esoteric groundstation design requirements. Clearly, this was a challenge for those "other guys." Well, maybe I learned just a little at that breakfast. The next thing I knew I was searching hamfests and ebay.com for things like waveguide filters, brick oscillators, and microwave relays. I was invited to a meeting of the Roadrunners Microwave Group (RMG) and joined (2). I asked smart people dumb questions. I carefully watched the progress of others, most notably G3WDG, OH2AUE, G6LVB, W5OE, and N1JEZ. While I was learning a little bit at a time, I was slowly collecting the odd parts and pieces to make up a 24 GHz system—just in case I "really" wanted to take on this challenge. Before I even realized it I had become a microwave experimenter! One of the lessons I learned in playing with S-band gear over the last two years is the importance of being able to separate—to filter out—nearby strong signals such as local oscillator (LO) components in the output of a mixer and both internal and external signals at the image frequency. Some commercial K-band systems successfully use 144 MHz as an IF (3). I was afraid building and tuning a junk/surplus/hybrid system that "close" to the desired frequency was beyond my capabilities. After all, I don't even own any microwave test gear. None. Yet. Concerns about strong LO products and image frequency proximity led me to follow a path I thought might be "safer" for a neophyte. I chose to use the now-comfortable 2,401 MHz as the first IF, allowing me to more easily filter out one side of the LO products and consequently placing the image frequency almost 5 GHz away from the desired frequency. A second benefit of this scheme is being able to use a filter wide enough to pass both the satellite band at 24,048 MHz and the terrestrial band at 24,192 MHz. A third, and significant benefit this scheme offers is using the 2,401 MHz first IF to hear the AO-40 S-band beacon in order to accurately point the antenna. This last benefit may prove to be the most noteworthy, as both N1JEZ and G6LVB tell me how very difficult it is to find the K-band signal in three-dimensional space. Starting with the received radio frequency (RF) of 24,048 MHz and an IF of 2,401 MHz, a simple mixer requires 21,647 MHz. The heart of the design is the mixer, a surplus P-com downconverter obtained from WB5TBL and documented by W5LUA (4). 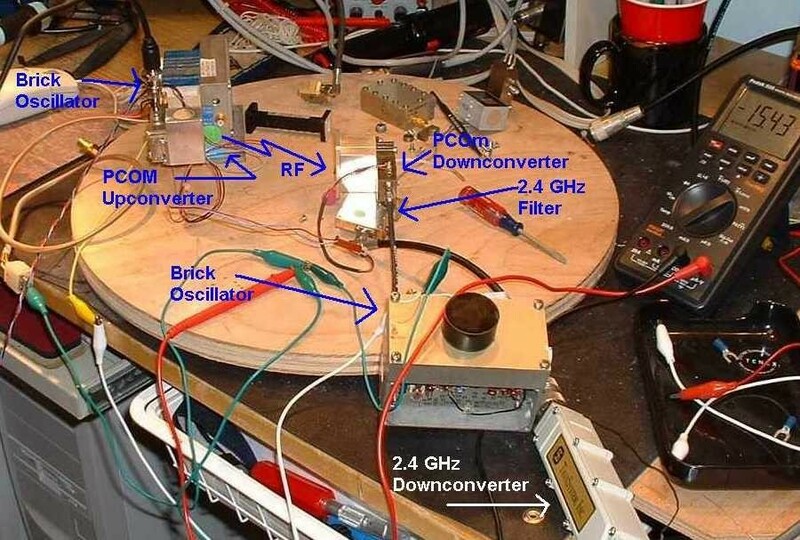 This particular downconverter has a built-in LO doubler circuit, ahead of the mixer, so an actual output of 10,823.500 MHz is required from the brick oscillator. The basic receiver frequency scheme is shown in Figure 2. Many of the design schemes popular for 10 GHz use high side injection of the LO. Using low-side injection, i.e., the LO frequency is below the desired RF frequency, allowed me to keep the LO below 11 GHz and also avoids the confusion of an IF tuning in the reverse direction from the RF. As it turns out, finding surplus brick oscillators in the 13 GHz range required for high-side injection is considerably more difficult than finding 10 GHz oscillators. The first order of business is setting the LO frequency. With the help of AG5RS and his well- equipped RF "laboratory," we set the surplus brick oscillator at 10,823.500 MHz. Then we arranged a P-com upconverter and downconverter pair to face each other across a 6" (150 mm) air gap and injected a test signal into the upconverter's IF port. We were stunned when we immediately heard the signal in the 145 MHz IF receiver (my trusty FT-100). AG5RS used his hand to block the 6" air gap to verify we were actually hearing the K-band signal and not an IF image or noise (both up and downconverters used 2401 MHz as an IF). Figure 3 shows the crude, but ultimately effective, test setup. I waited until this first critical test was completed before taking the next steps: buying a DB6NT preamp and designing and building a portable "rover" type setup. The new preamp was a bigger investment than the total of everything I had spent so far, but it was a critical component to achieve the needed NF and gain. For the adventurous, W5LUA has an inexpensive home-brew design you may want to tackle (5). Following the successful laboratory trials, the receiver design matured to the one shown schematically in Figure 4 and in mock assembly in Figure 5. I realized finding the K-band downlink within a degree or two was going to be difficult and was designing a system with an inherent S-band receive capability. This is a nice concept, but, I had not really addressed how this would be accomplished on the antenna hardware end. 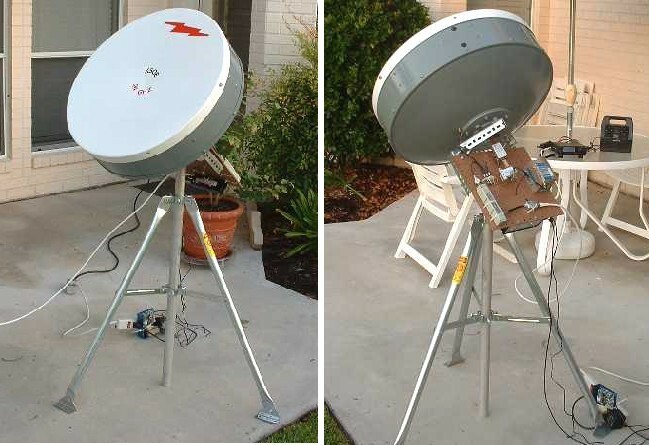 I had envisioned a dual-band patch feed on an 18" DSS dish; using the techniques developed for 13/23 cm dual feeds (6). I had recently seen W5OE's 10/24 GHz system on just such a dish, albeit using a more conventional feed horn and waveguide assembly. Then I found a surplus 2' Andrew 23 GHz prime focus dish on ebay—a change in the plan. 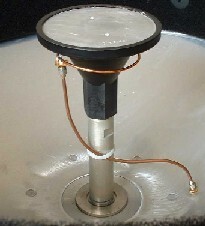 I had also recently seen K5VH's 2.3/10 GHz antenna using a conventional 10 GHz splash feed and a 2.3 GHz loop feed (7). I built a full-wave loop as the 2.401 GHz feed element, placing it one-half wavelength in front of the K-band Cassegrain reflector. Much like a 2-element beam, the feedpoint impedance is close to 50 Ohms. The loop presents minimal blockage of the K-band feed and is routed out of the antenna via a piece of semi-rigid coax and a bulkhead SMA connector. Figure 6: S-band Loop Feed In Front of K-Band Feed. Several voltage levels are required to put this hodge-podge of parts together in working fashion. At least 16 Vdc was needed for the MMDS downconverter and the 28 Vdc-rated SMA relay. 12 Vdc was needed for the P-com mixer and the DB6NT preamp. 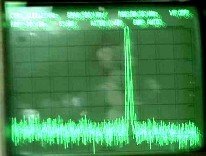 The Frequency West brick oscillator utilized –20 Vdc. Finally, to convert the system to terrestrial work later, I would also need –5 Vdc for the matching P-com upconverter. The circuit uses a 7812 for the +12 Vdc, a 7905 for the –5 Vdc, and the +18 and –18 Vdc float on the power cube output. The power supply is constructed using simple point-to-point wiring, is contained within a 5x15 cm enclosure with terminals on the back for connecting the various receiver components, and has a pair of 1/8" jacks for connection of +/- 18 Vdc from the outboard power cubes. The two LEDs on the right are used for verifying status of the + and – power busses, and the switch and LEDs on the left are for the S/K relay. After completing the power supply and powering all the components, however, the –18.5 Vdc circuit drooped to –14.5 Vdc as the brick oscillator drew over 350 mA. Testing of the oscillator showed it would operate at the reduced Voltage, but the output of the oscillator was also reduced from the specified 11 dBm to 7 dBm. This was a minor setback, but I searched around the junk box and found a small power supply to substitute for the negative supply cube while I continue the search for power cubes with a little more "oomph." This modular design allows any external sources of +/- 20 Vdc to be used. The next step was to integrate all the components in a close-coupled physical arrangement behind the dish. N1JEZ's crafty setup provided the inspiration for the almost-ready setup shown below (8). Obviously, the system is set up like a "rover," and not for fixed ground station operation. It is also a fair-weather design. The common hardware peg board is quite handy for bolting and tie- wrapping the components in place as well as for routing the power cables through to each device; ending up with quite a neat arrangement (on top of the board, anyway). The curtailment of K-band operation on AO-40 was disappointing, but it also gave me a little more time to work on the system. I made the trek out to K5GNA's shop to put the integrated system on his HP analyzer. We generated a signal at 12 GHz and looked for the harmonic at 24 GHz. We were rewarded with a huge signal visible in the 2nd IF's VHF output, as shown in Figure 9. The overall system measured 54 dB of gain. I subsequently took the equipment home and set up my own trial using more modest "test" gear. To generate a test signal at 24 GHz, I employed my GM1SXX-designed "duckling" S-band marker oscillator at 2401.500 MHz with the "antenna" generating weak harmonics of the Drake's LO and close-coupled to the waveguide input to the receiver's preamp (9, 10). The "signal detector" used was my FT-100. Finding the signal on the 2nd IF's VHF output was not difficult, but the warm-up drift of the MMDS oscillator was significant once multiplied 10 times! A temperature-stabilized S-band oscillator would make a good tool to have around the shop. With AO-40's K-band transponder temporarily off, I opted to do a mock test using the complete system and testing the S/K switching function. The satellite was around MA=220 with a range of 30,000 km and a squint of 15 degrees. It was a simple task to manually point the antenna and find the S-band downlink. I was unsure what to expect from the unproven loop feed, but was grateful to see the signal at 5 S-units above the noise on my FT-100 (about equal to what I receive on an 18" DSS dish with patch feed). That proved the S-band half of the setup works to expectations. To complete the K-band simulation, I then set my mock-AO-40-K-band-signal on top of the patio table—the 2401.500 MHz signal source. The 10th harmonic is at 24,015 MHz. I then rotated the antenna and quickly found the signal with an S9+20 dB reading on my FT-100. I completed the simulation by rotating the antenna in azimuth and confirming I could "lose" the signal. It was a good simulation and I feel I am ready for AO-40 now. I look forward to the K-band downlink's return in the fall/winter of 2002/03. As of writing this I have yet to hear the AO-40 satellite downlink on K-band, but I have learned a significant amount in this venture. 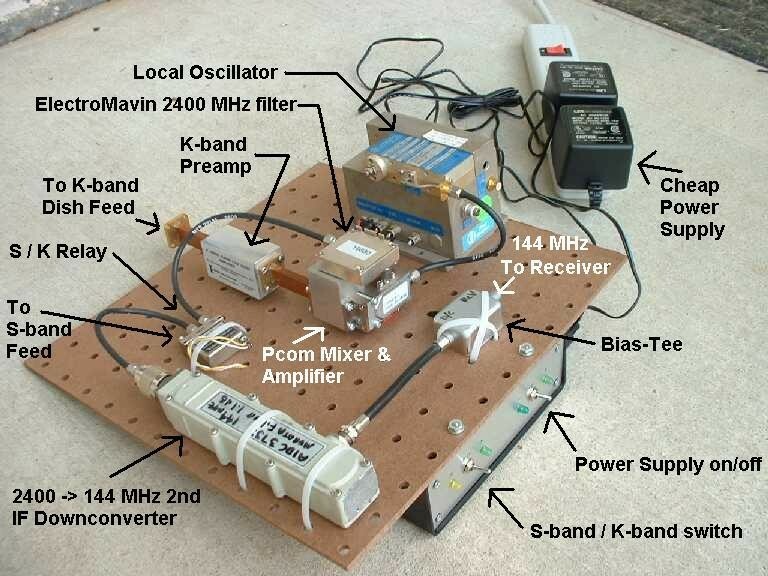 With the exception of the DB6NT preamp, this system is not much more expensive to home brew than one for S-band. I have not spent a "king's ransom" and feel like I got a solid introductory education in microwaves just by taking the plunge. Many people came forward to help me: I could not have done it on my own. I still have much to read to better comprehend microwaves and microwave construction, but I certainly know more today than I did last fall when I went to the K-band breakfast. Finally, one bit of advice I offer from my experience is to either 1) acquire the test gear first or 2) line up somebody who has the appropriate equipment and can help you. You won't get far without it. 1. 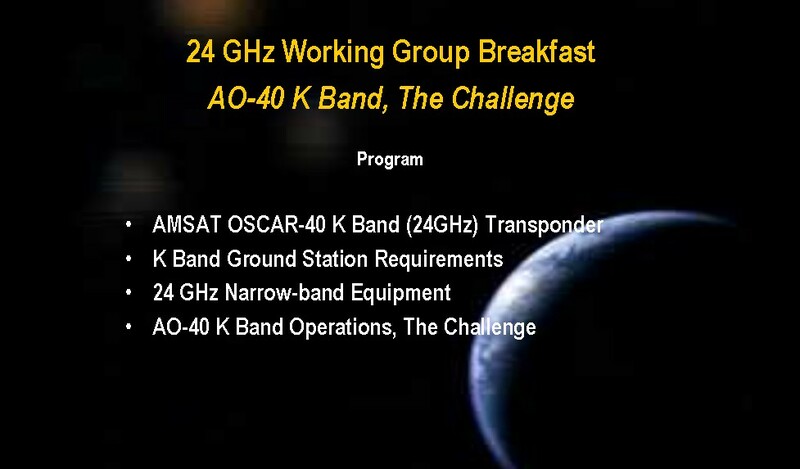 Fernandez, Antonio, KC2HAX, "24 GHz Working Group Breakfast: AO-40 K-Band, The Challenge," http://www.sunsunsun.net/kd4app/ao40/Kband4.ppt; also see KD4APP's site for more info: http://www.sunsunsun.net/kd4app/ao40/kband.htm. 2. Roadrunners Microwave Group, http://www.k5rmg.org/. 3. Kuhne Electronic Microwave Components, DB6NT 24 GHz system, http://www.db6nt.com/. 4. Ward, Al, W5LUA, "Using Surplus 23 GHz Modules at 24192 MHz," Microwave Update 2000, ARRL, pp. 27-35. 5. Ibid, "Inexpensive Components for 24 GHz," Microwave Update 1998, ARRL, pp. 246-256. 6. Brown, Gerald, K5OE, "Dual Band Dish Feeds for 13/23 cm," Proceedings of the 17th Colloquium, AMSAT-UK, pp. 37-43. 7. Haddon, Tom, K5VH, "Multiband Microwave Loop Feeds - and Variations," Proceedings of the Southeastern VHF Society, April 2002, ARRL. 8. Seguin, Michael, N1JEZ, "AO-40 K Band Receive Equipment"; http://members.aol.com/mike73/. 9. Copeland, Al, GM1SXX, "Project Duckling - or - Uses for Dead Drakes," The AMSAT Journal, May/Jun 2001, pp. 8-9. 10. Brown, Ibid, "S-Band Tips, Tricks, and Toys, The AMSAT Journal, Nov/Dec 2001, pp. 28-30; also see http://members.aol.com/k5oe.